The following client information can be recorded for each employer in BrightPay. 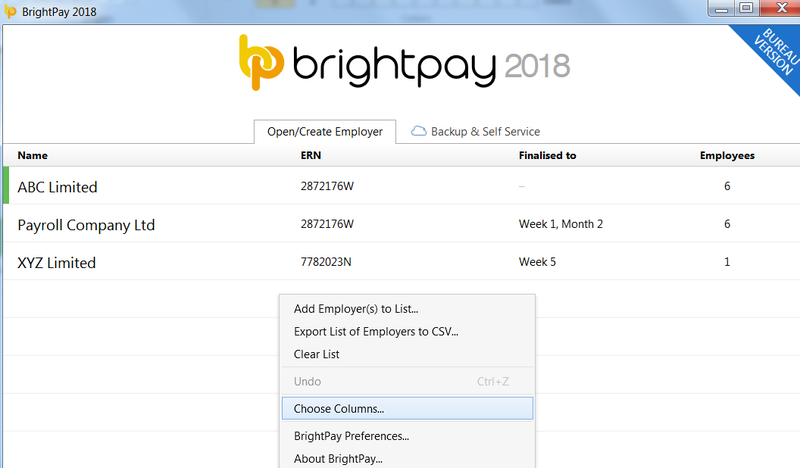 This information can be entered or edited directly via the BrightPay Open Company screen, by right-clicking on an employer and selecting the "View/Edit Client Details" menu option (this menu also includes a quick one-click link to set a label colour). Alternatively, the information can be entered via the "Client Details" tab in "Edit Employer Details" when a company is open in BrightPay. To set the columns to appear on the startup window, right click on the open employer screen and select "Choose Columns". Select the columns you would like to display, followed by "OK" - the startup window will now be updated to reflect the changes.